At Living Branch, worship is heaven on earth, where God comes to give gifts to His people. We follow the classic Christian pattern for worship, using a variety of songs and dialogues from different times and places to relive the Story of Life. We are a welcoming, laid back community, ranging in age from 9 months to 99 years old. Most of us dress somewhere between casual and business casual, and our services are about an hour long. We are more than understanding of all the wiggles and noises that accompany children in worship. You are more than welcome to sit up front so your children can see what's going on. We have activity bags, a nursery, and a part of the service where they can come forward and learn about what we're talking about that day. Adults meet in the fellowship with coffee and donuts for an informal Bible study. Youth meet in our bell loft for Bible study. Children meet downstairs for Sunday School. Tuesday Afternoon Bible Study is every Tuesday at 1:00 PM during the school year. Women's Ministry meets once a month on a Tuesday evening for an activity and Bible study. Those who enjoy reading and talking about it meet every third Sunday of the month at 6:00 PM at someone's home for a meal and casual book discussion. 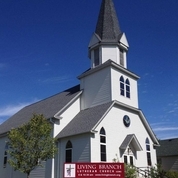 Living Branch was established in 1997 as a new church plant in North Branch. Pastor Steve Ferber was called by the Minnesota North District of the LCMS to begin a new congregation in a city that had no Missouri Synod presence. In 2014, the Holy Spirit brought us Micah Schmidt to be our new pastor. We are a Christ-centered, biblically conservative, informal, joyful congregation. We love the Lord and and His Word, and want to share His life with the world. We invite you to join us at Living Branch. Come as you are!